Well, I’ve been somewhat off the radar over the past few months. In that time I’ve finished off a couple of big jobs, made it through Christmas and the 6 week long school holiday (including a glorious week in Tasmania), and got two exhibitions up. Most recently, I made the five hour drive to Mildura to install an exhibition of my work at The Art Vault, a fabulous gallery who are incredibly dedicated to their artists. I’ve been lucky enough to be on their books for several years, and was thrilled to be invited to exhibit in their main gallery as part of the 2015 Mildura Wentworth Arts Festival. I left home in the dark early hours of last Tuesday morning, driving until the sun joined me, then driving, and driving, until it was nearly overhead. The welcome at gallery was as warm as that Mildura sun. I unpacked my work and was swept a couple doors down for lunch with Julie, The Art Vault’s passionate and indomitable director. We talked art and politics and returned to find the works all up on the wall! Andrew (seen in the lower left corner below) is some sort of spirit-level-eyed wunderkind. As penance for disappearing during the important work, I helped Andrew hang the exhibition in their middle gallery: beautiful and haunting photographs by Sophia Szilagy. After conferring with Mia, Sonja and Anne at the front desk (all gorgeous women and blindingly talented artists themselves) about price lists, etc, there was nothing for it but to entertain myself until the opening on Wednesday night. I wandered the streets of Mildura, ducking between air conditioned shops, the Mildura Art Gallery and back intermittently to my apartment at The Art Vault. Not surprisingly, a highlight was The Cellar Door, which has free tastings of the regions varied and very reasonably priced wines. I bought two. On for me, and one to take home. The opening itself was a delightful blur. 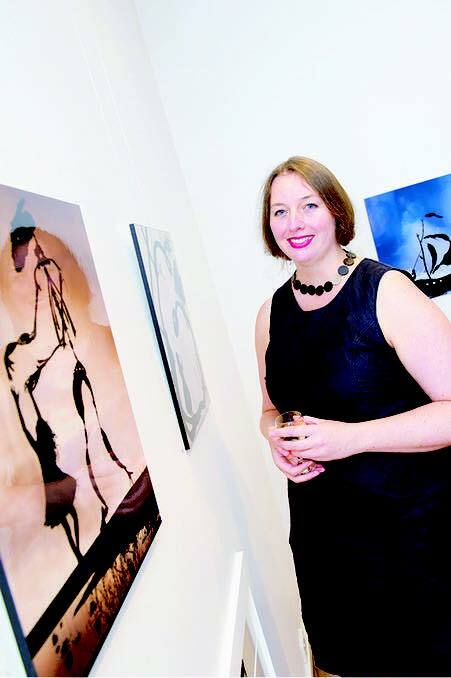 It began with a chat with Danielle Hobbs: Artist, Photographer and La Trobe University Visual Arts Lecturer, who later opened the exhibition with insight and grace; and continued with two media interviews (with ABC radio and Sunraysia Daily Newspaper) as people wandered in. I finally managed to hunt down a glass of wine, most of which I spilled while gesticulating in conversation to various very nice people over the evening. Thanks to Laura Donges from Sunraysia Daily for the photo below. You can read the first part of the article here. See the iron grip on that glass? Didn’t stop me from sloshing it over myself and the floor. Eventually the crowd thinned out, and again I was whisked away, this time for dinner at The Mildura Brewery. Ten of us sat round the long table, thanks to the very generous invitation of Julie and her husband Kevin. Danielle and I bonded further over motherhood, fairy tales and home brewing tales, which seemed most appropriate under the watchful presence of the huge beer vats at the back of the restaurant, and we parted ways with my promise to make a batch of chilli cider and send some up to her. Stefano De Pieri doesn’t hold back with good food and wine, and we just managed to roll back to our various accommodations. I made the long straight drive back the next morning, still buzzing with the incredibly warm and generous welcome from all I met, in particularly Julie, Mia, Sojna, Anne, Andrew and Robert at The Art Vault. I arrived home to warm cake and hugs, happy to be back in the arms of family, and the ‘cold’ climate of Castlemaine.